Total Lake Storage 14.28 Mcum out of 14.47 Mcum full capacity, 98% full. Lake info from Vagarian Jayesh Mehta. Torrential Rains lashing Mumbai post Afternoon 19th Tuesday. Some of the figures are crossing 300 mms in the suburbs as shown earlier. The Current Low (Vortex) over Mumbai will gradually weaken and fizzle out inland East of Mumbai by Wednesday Morning. Hence, we can expect the rainfall over Mumbai to decrease in intensity Wednesday morning. Moderate intensity till morning. 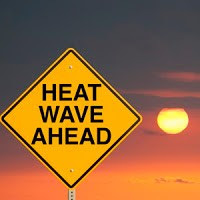 But less rains on Wednesday , and we can expect ( after Scruz recorded 225 mms and Colaba 169 mms till 11.30 pm IST) around 35-40 mms on Wednesday till evening, meaning a heavy shower or two possible. However, it will remain windy with gusts till evening. Otherwise, situation will be much under control with no prolonged heavy showers. BB-12 has moved inland into Odisha. Will track towards M.P. and first strengthen on land, but fizzle out suddenly over West M.P. Monsoon Withdrawal has commenced from Extreme Western parts of Rajasthan. Rains have eased off here in Mira Road. Torrential rains hitting Navi Mumbai - even after 24hrs now heavy.... MUM (SCZ) may cross 3000mm by sept end. 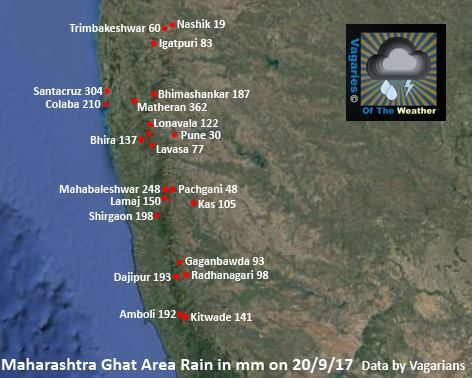 Mumbai / MAHA wettest September ever recorded! West coast trough + Bay lows + UAC over GUJ/RAJ/MP create havoc over MAHA/GUJ Arabian sea... this has happened multiple times 2017 monsoon - strange fact they all appear at same time. Non stop torrential - increasing every minute- heaviest september seen, stat of art infrastructure Navi Mumbai flooded - huge waterfall from all hills gushing down, streams overflowing.. nature anger mode! 2nd triple century this season. Has that ever happened earlier? Not sure. @Rohit, also, 13 times in 44 years is when we take 8.30am to 8.30am recordings. If we take any 24 hour cut then the number of such high rainfall events will be even higher. As an example, I remember 30 June 2007. Nearly 400mm but got split between two tecordings on either side of 8.30am. Therefore, such events aren't uncommon and fairly regular in our region. But if we go by official IMD statistics this year there are 2 instances of extreme rain. This might be the first instance in recent years when here are 2 extreme rain events in a single monsoon. as this system fizzles out , sir do you think again there will be thunderstorms before withdrawal may be in sep end from extreme north side ? after this low pressure fizzles out , sir do you think mumbai will experience thunderstorms again just before withdrawal i mean by sep end or oct first week from extreme north ? @Rohit - Interesting. Which year? And which station - Scz or Clb? Would be great in case you could share the figures. Many thanks! Borivali 350mm++, world largest forest within city limits -> Sanjay Gandhi National park - stretching from Borivali - Thane - Virar, catchment for many lakes, mountains - not sure what will happen to LIONS ?? 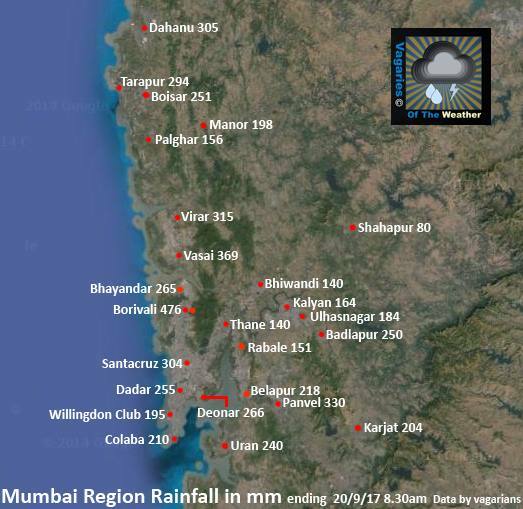 Contrary to the belief ..Mumbai didnt have more than 300 mms 24 hr official rain event for past 11 years ..This is surprising as the city gets such events 2 to 3 times each decade..So those barbs about extreme rain events due to climate change need to tone down..
@Rohit: Agree. Nothing has changed much. In fact, many times in past decade, Mumbai just missed out on these extreme rains. Just last September Dahanu had two of them. In general, Southernmost Gujarat and North Konkan are prone to and have always got such events. Even South Konkan doesn't get many - It is similar to Goa, Coastal Karnataka and North Kerala. They get more average rainy days than us but lesser extreme rain spells. There are various factors at play, every area is unique and, therefore, I hope we can stop comparing weather across geographies. Medium to heavy rain in santacruz. At present Santacruz - Mumbai overtakes Mangalore. Mumbai-Santacruz excess of +800mm. Very soon entire Konkan will go into excess zone! Is it wettest september? Colaba: Mumbai Colaba crosses 2500 mms for this season...2507 mms As on 26th September. Recent crossing 2500 mms was in 2011 when Colaba measured 2879 mms ( Full Season) and in 2010 when this station saw 3291 mms till Monsoon withdrawal. Highest ever Seasonal total for Colaba is 3482 mms in 1954. Santacruz: Total on 26th September for this season stands at 2893 mms. 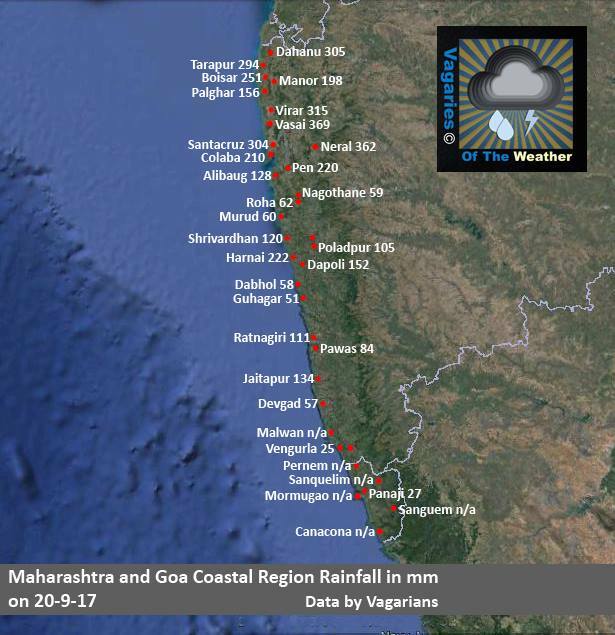 Recently in 2010, SCruz measured 3392 mms till Monsoon withdrawal. Highest ever at Scruz is 3785 mms in 1958. Colaba: This year 2016, as on 25th September, this Month has recorded 731 mms , while wettest ever September was in 1988 and 1993, when 832 mms was recorded. Santa Cruz:2016 September, Scruz has received 703 mms, still short of the record september of 1993 when the month saw 905 mms. Incidentally, 2011 had the Longest Monsoon Season for Mumbai, when the Monsoon withdrew on 24th October, after lasting 141 days ! Rains continue since morning moderate heavy at times. September months average rain in a day and half. @sset : you bombard this blog with irrelevant, and fictional statistics. And then frequently you keep referring to Kea blog. I also visit that blog regularly but I don't see you posting similar comments there. Or if so, could you tell us under what name do you do so ? According to me, you would be thrown out of that blog if you try such comments there. I made this statement to you last year too. But you do not seem to be heeding good advice. So I again request you to try to posting these comments there and maybe let Vagaries be enjoyed by genuine monsoon lovers without biased comparison. @sset - And please have the basic protocol to atleast enter your name rather than hiding behind an anonymous series of alphabets. That is the least you can do to respect Vagaries and a request made by Rajesh to you multiple times. Badlapur max temp 23.6°C today, so an coolest day of 2017 so far !